Bogey learning to do a free stack. About Bogey . . .
Bogey was a big sweetheart who likes everybody and thinks that everybody should like him. 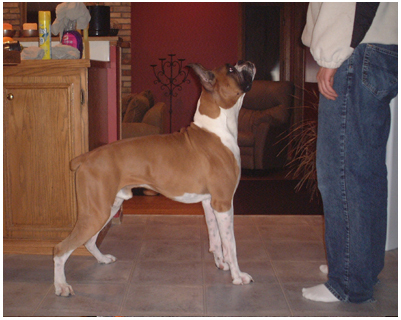 He lived with and is loved by Robyn Lynch and Audra Young of Regina, Saskatchewan. 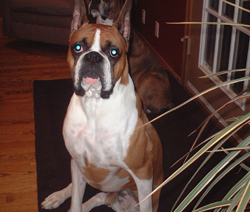 Bogey shared his home with another Zaracon Boxer, Levi (Zaracon's Jazz Gone Wild). Levi, a littermate to Cheyenne, was much older and wiser than Bogey and he never let Bogey forget it. Sadly, Levi passed away on 20 July 2004. Bogey was Sawyer's first born puppy out of her first litter. He was the biggest puppy we had ever seen! Along with his huge size came his tremendous desire to be with his people -- he was a sweet, gentle boy that loved to play with his toys -- the more the merrier! Unfortunately, on 25 June 2010, sad news came of Bogey's passing that evening. Rest well, baby boy . . . you were a champion to us! Bogey’s show career . . .
Bogey only goes to the occasional dog show. Like his littermate, Briar, Bogey is slow to mature, and that's okay; he's a big boy with lots of leg and not much body to go with it yet. Bogey is currently sitting on two points towards his Canadian championship. 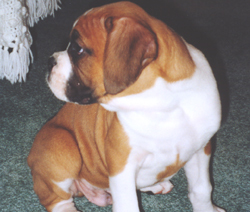 In February 2004, Bogey obtained two points for best of breed under judge, Merlin Vandekinder. Bogey at various stages in his life . 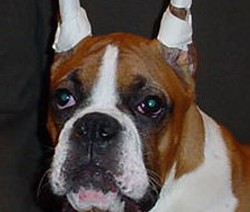 . .
Bogey with his ears taped.